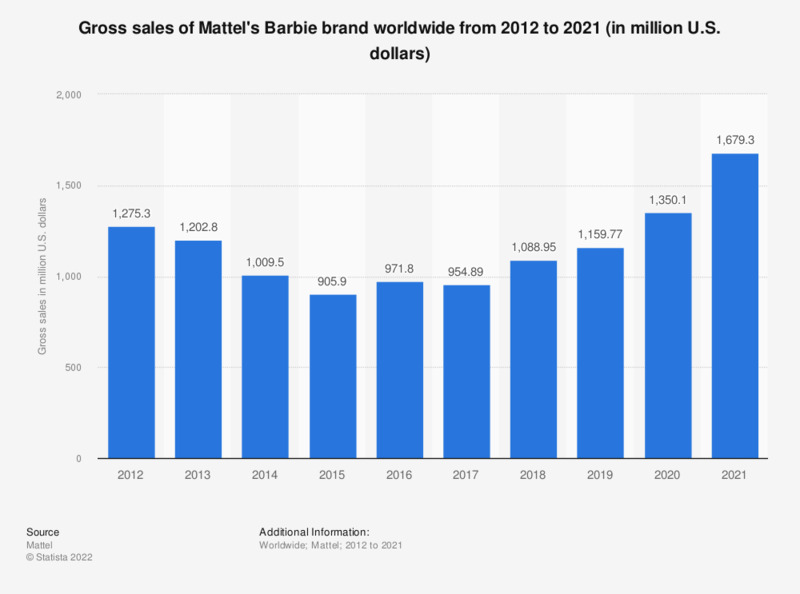 This statistic shows the gross sales of Mattel's Barbie brand worldwide from 2012 to 2018. In 2018, Mattel's Barbie brand generated gross sales that amounted to about 1.09 billion U.S. dollars, up from about 955 million U.S. dollars the year before. Since the launch of Mattel’s Barbie fashion doll in 1959, Barbie has become a cultural icon in America and around the world. The commercial success of Barbie has allowed Mattel to become the ninth most valuable toy brand worldwide as of 2018. Although a truly worldwide phenomena, a considerable proportion of Mattel’s sales come from America and Canada. A look at the gross sales of Mattel by region worldwide from 2009 to 2017 shows that over half of Mattel’s income comes from the North American region. Just as in other business markets, the success of Barbie does not ensure for commercial success to be guaranteed in the future. Competition over retail doll sales in America is fierce. Despite some fluctuation in recent years, the total sales for toy dolls in the U.S. lies consistently in the range of two to three billion U.S. dollars. Given the recent drop in sales of Barbie dolls it is clear Mattel must increase interest in Barbie and their other products if they are to retain their current market share.